I had a few leftovers from a spinning workshop I held recently. I made sure workshop participants took away all the roving I’d dyed and braided and all the batts I’d made, so they could practice at home. And we made more batts as part of the workshop and that was fun too. But there were little bits left from demonstrating techniques. Sometimes leftovers are the best part of a meal, and I really enjoyed spinning up the pink and purple end of a piece of roving, and corespinning one gloriously red batt–merino, silk and green sparkly stuff. And that meant I found the neglected bobbins of eucalyptus-dyed merino that I had blended with some commercially dyed merino/silk in golds and reds. So those singles finally got plied. It’s nice to be back at the wheel. It’s been too hot for dyepots! Isn’t the world an immense and diverse place? Storming half a hurricane doesn’t sound relaxing. I hope you’re warm, safe and dry. 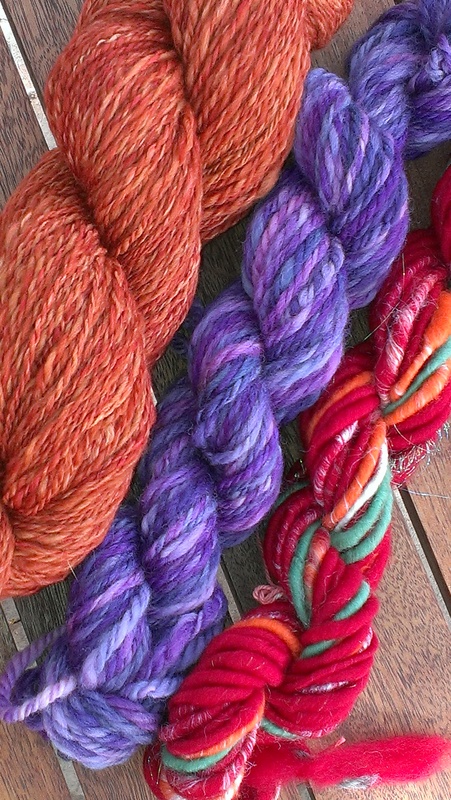 Those skeins look like fun! I really want to start spinning on a wheel—it is so soothing and satisfying. It is very soothing and satisfying! I never really got back to my spindles after getting the wheel. I only use a spindle on the odd occasion now too. And yes! Soothing and satisfying works for me as well. Wow, what a dream! We sure do have children playing under sprinklers here, and the weather has been hovering just below 40C… I hope it was a happy dream! It was! I often dream of traveling to places, but never dreamt of Australia before. 40C—that sounds just like our summers here in St. Louis. Definitely the kind of heat that makes you rethink standing over a hot stove or a fire!